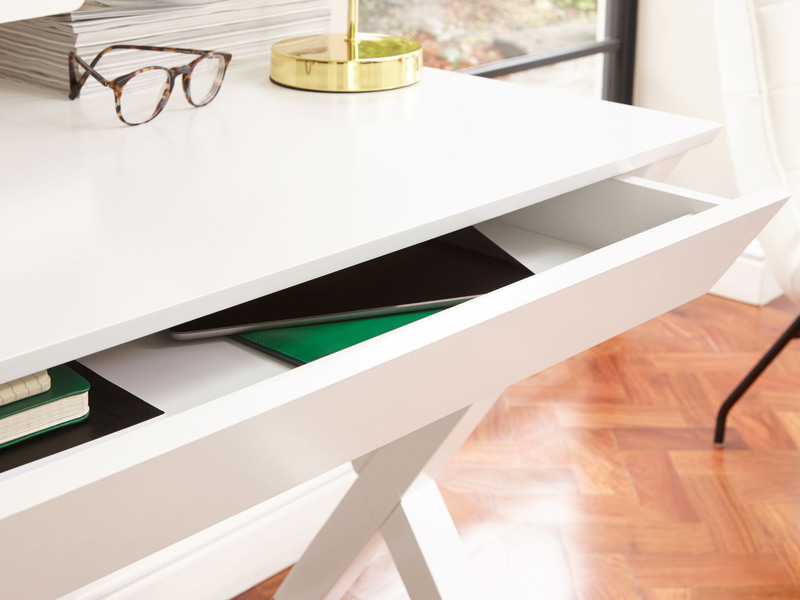 Whether it's the kids sitting down to study or you putting in those extra hours after work, the Trestle Matt White Desk offers such a neat, tidy and organised space for everyone to get their work done. The matt white finish gives this desk such a fresh and modern feel, while the drawer and cross leg design allow plenty of room for seats and storage. 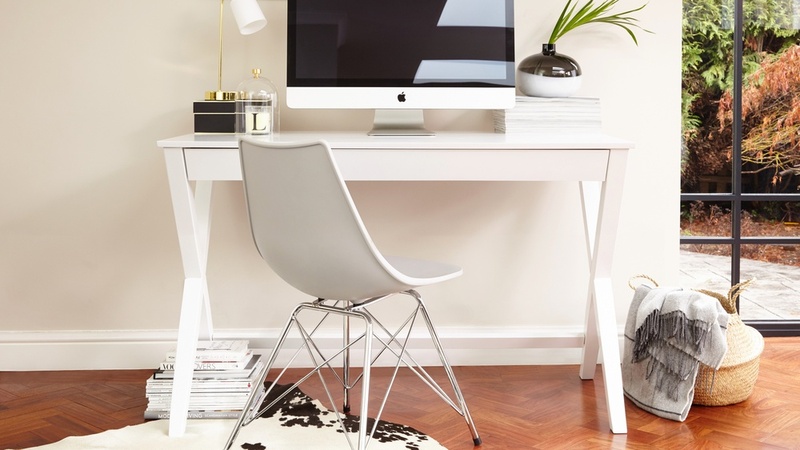 All you need to decide is where to place this modern desk in your home! The Trestle desk measures 120cm x 60cm x 75cm. This considered sizing means the desk is compact enough to fit in a variety of spaces in your home, but still provides enough surface area for laptops and books, making the desk incredibly practical. The finish of the Trestle desk is matt white. Matt white is a durable finish, especially when treated well. This makes it a great material choice for something that gets used as often as a work surface. This modern desk has one drawer that runs the full width of the desk along the front. Having one wide drawer is very handy as it's that bit easier to store various office stationery, as you're not restricted by width. The design of the drawer is subtle, almost secret, which adds to the desks neat and polished overall look. The legs of the Trestle desk are a cross shape, with a cross bar running from either leg near the base. This keeps the look of the desk open, while also offering plenty of stability and support. Another benefit of the Trestle leg is that it makes the desk appear narrower and therefore takes up less space, making it an ideal fit for many previously unused spaces. The Trestle desk would work wonders in a home office as a study space, but could also be used in a bedroom as a vanity table, making this desk very versatile. Simple and modern in shape with angular details and clean lines, the Trestle Matt White Desk is an ideal workstation for modern family homes. If you're after something slightly different, we have a range of desks available including the Cavour Black Glass Desk which is similar in size but with a black powder coated and frosted glass finish. One of the great features of the Trestle desk is the drawer. 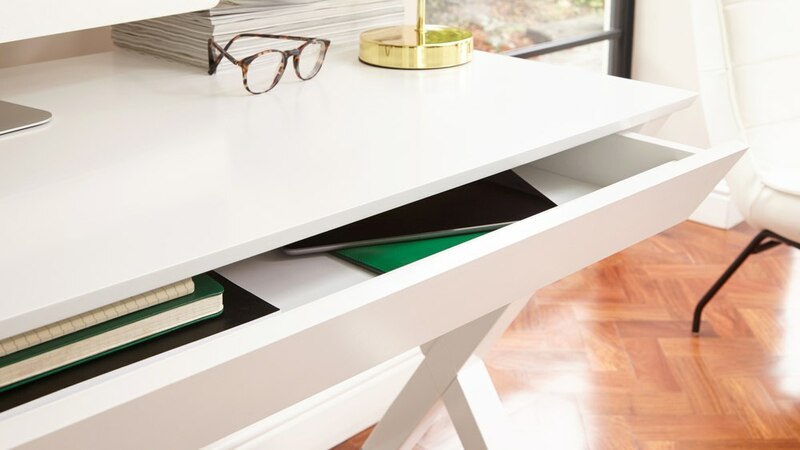 It runs the full width of the desk to provide plenty of handy storage space, yet its subtle design makes it such a sleek and streamlined feature. Being full width means you are able to store much more in the desk than in a small rectangular drawer, making it very practical. 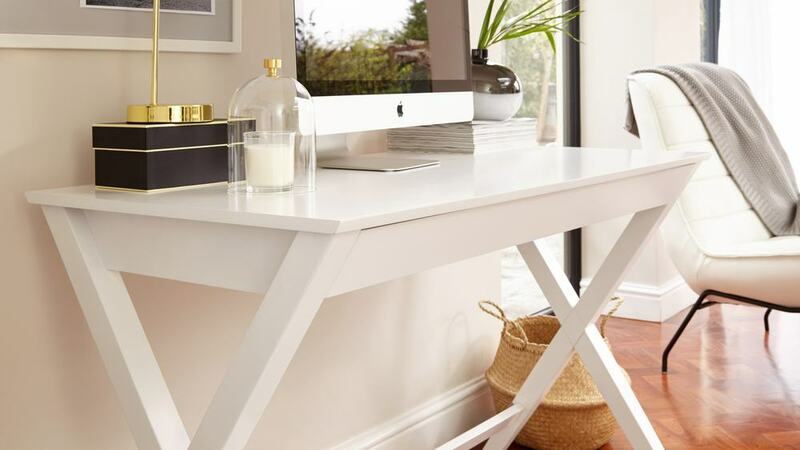 Stylish and functional, the Trestle Matt White Desk is definitely a piece for the style conscious!